As a maiden of battle, Valkyries were often garbed not in flowing clothes and robes that accented their beauty, but in armor, making them both terrifying and stunning to behold. And in this Valkyries Skirt, you will be quite the sight to see as well! This skirt is a fitting accessory for a maiden of battle, featuring a style that combines both the armored look of a tasset and the elegant look and feel of an actual skirt. It is carefully crafted from high quality 9-10 oz. leather, which means that its fairly light in weight, yet still strong enough to stand up to the rigors or LARP or mock combat. 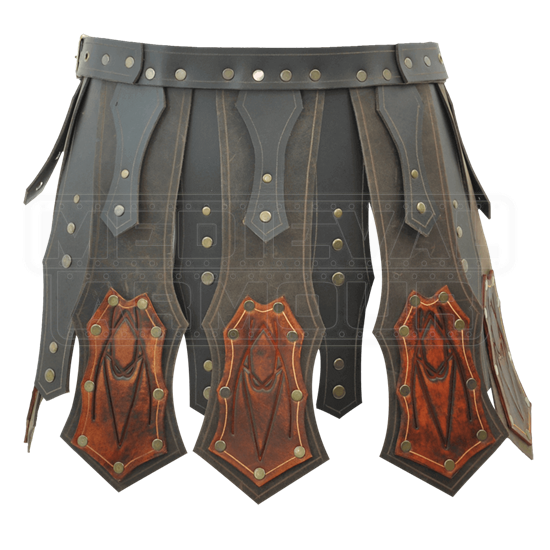 The skirt is worn using a leather belt strap that features buckles on both sides, making it quite adjustable, no matter what size it is. From the front of the skirt hangs a trio of long tasset plates, which are reinforced with brown leather plates that have been engraved with ornate knotwork designs. 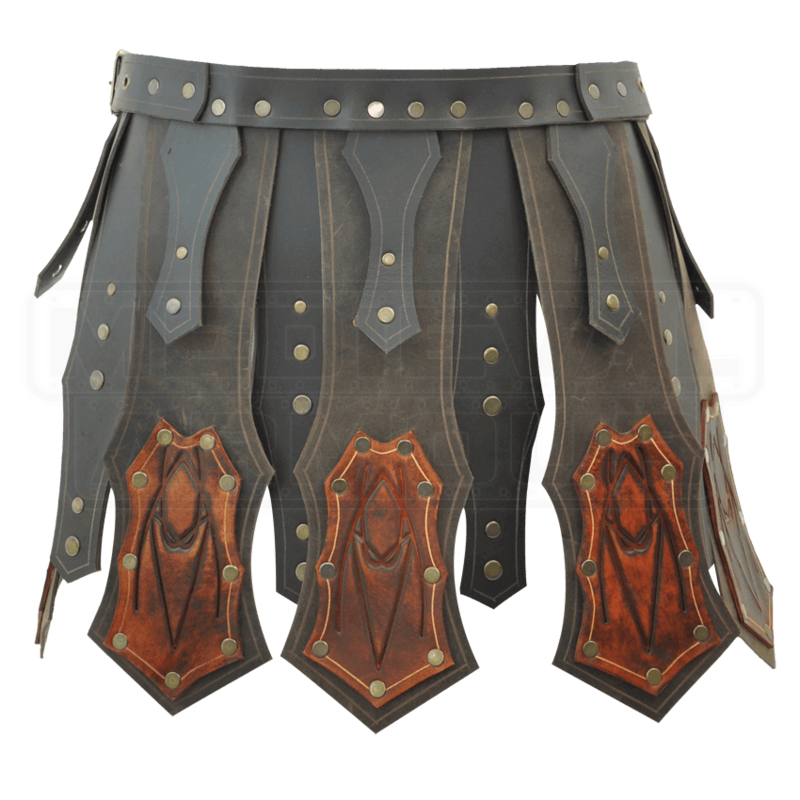 Smaller strips of leather rest between the tasset plates, creating a full skirt effect in the front, while the back of the armor features only one hanging tasset plate and two flanking leather strips, creating only a partial skirt in back. This armored skirt comes in one color and four different sizes. Each size is fastened at the waist with two leather belt straps, making the skirt is also quite adjustable between those sizes. As such, you should always order your skirt as close to your normal measurements as is possible, and adjust to comfort when you are wearing it. Rarely in life are things both deadly and beautiful, but you will have a chance to be just that when you wear this Valkyries Skirt, emulating the look and feel of the deadly Norse maidens of battle.